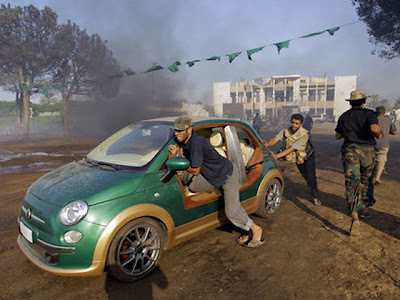 Maybe you've heard the news: Libyan rebels have taken Muammar Gaddafi's one-off electric Fiat 500 as booty after capturing the capital, Tripoli. With the rebels' propensity to turn everyday drivers into battle wagons, I wonder what they'll do with this new subcompact? Maybe a .50 caliber? A rocket launcher? Maybe they'll just save this one as trophy. Regardless, it was certainly not something I expected to see with regards to the situation over in Libya. Jalopnik has more info about this car. Check it out. Too bad for the car. The rebels certainly don't know what to do with it. The car's in a really bad shape. If it turned that way, it may have been the most expensive warfare equipment made with sentimental value. Sorry for the political diatribe. As for the Fiat, they can keep it. Like a VW mechanic once told me, "VWs are great, as long as they have a warranty." I feel the same way about Fiats.